Journal deadlines and other news have delayed this post, which really should have appeared two days ago. 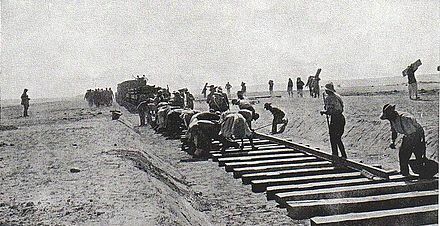 Last summer we traced the Ottoman Army's second advance toward the Suez Canal, and its ultimate repulse at the Battle of Romani in August of 1916. During the remainder of the year, the British Empire Forces (mostly ANZACs). The advance was slowed by the need to build the railroad line and a pipeline for water forward as they moved. Finally, in two actions in eastern Sinai in December 1916 and January 1917, the last Ottoman troops were pushed out of Egyptian territory. With the Battle of Rafah a century ago Monday, British war historians mark the end of the Sinai Campaign. The Main Allied force was rhe ANZAC Mounted Division, consisting of the 1st, 2nd, and 3rd Australian Light Horse Brigades and a New Zealand Mounted Rifle Division. From December 1916 these forces were assigned to the Desert Column, formed to support operations in Sinai and Palestine. On December 20, 1916, the Allied force reached El ‘Arish, where they discovered the Ottoman force had evacuated the town and withdrawn up the Wadi El ‘Arish to the vicinity of Magdhaba to the southeast. (See map above. Illustrations are from Wikimedia.) 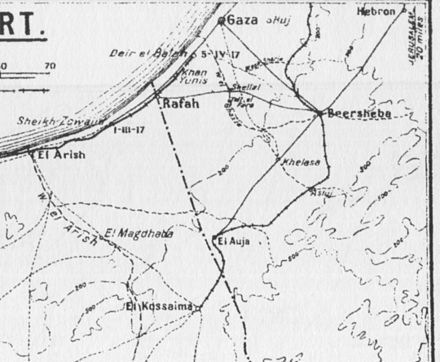 Unwilling to advance beyond El rish while leaving Turkish and German forces behind their right in a fortified position at Magdhaba (not far from the big Turkish support base at Hafr al-‘Auja, just inside the Palestinian side of the border). The Commander of the Desert Column, Sir Phillip Chetwode, arrived at El ‘Arish with supplies from Port Said, and prepared to dispatch the ANZACs under Sir Harry Chauvel. 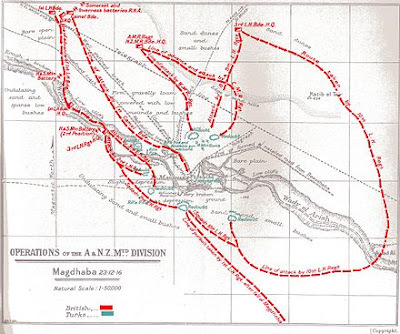 The German Commander of the Ottoman Desert Force, Kress von Kressenstein, had constructed a series of fortified redoubts at Magdhaba which he thought could resist attack, but he reckoned without the high mobility of the Light Horsemen. The ANZACS, under Sir Harry Chauvel, advanced on the night of December 22-23, and in a fierce battle on the 23rd succeeded after a day's hard fighting, forced an Ottoman surrender. The fight at Magdhaba had set the stage for the Battle at Rafah, the last act in Sinai.